I was reading through my Facebook news feed. And, despite the fact that I follow some pretty loving and good-intentioned people, there was so much pain and sadness being shared. News stories featuring violence against people and animals. People mistreating others, devaluing life. My friends aren’t trying to spread negativity, but as they rally against it, they’re sharing graphic images, and I’m feeling the horror that the images are meant to bring forth. So I needed some help accumulating some love and light, to counter that energy. And, in asking for help, I posted one sentence. That sentence engaged a reaction from many of the wonderful people who are friends with me here. They shared comments, which you can read below. Beautiful words, full of vibrant love energy. Words which carry a high frequency that can heal. 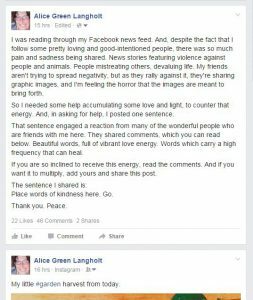 If you are so inclined to receive this energy, read the comments. And if you want it to multiply, add yours and share this post. Place words of kindness here. Go. The response I got was pretty impressive. So far, there are 46 comments. Many compliments, and other positive words. Some shares. More are trickling in. I see Facebook as a purposefully designed community. Each member of this community is invited into our lives by us giving them attention. It could consist of people, ideas, styles of music, movies, and food, but what’s nice about Facebook is each post that we allow into our feed is there by our choice. (Except for ads, I guess, but we can adjust our preferences for those too). I choose to follow a lot of positive people and ideas, because that’s representative of the ideas which I want to allow into my own field. That usually works out well. I see what’s happening, get some inspiration, share my thoughts, expand, encourage, and share what speaks to me. But, I also notice that positive people sometimes try to be a voice for change. Nothing wrong with trying to make the world better – I’m all for it. But, sometimes in doing so, the post shared may include a horribly tragic link or image to get some attention to that cause. Seeing those posts feels almost like I decided to turn on the news. And I decided to turn OFF the news years ago. That’s what happened to me yesterday – I saw many upsetting posts and pictures in my news feed. The causes were just, certainly. But the energy around the posts was inducing a visceral response, which instead of moving me to action, just brought about horror, grief, and an underlying feeling of helplessness. 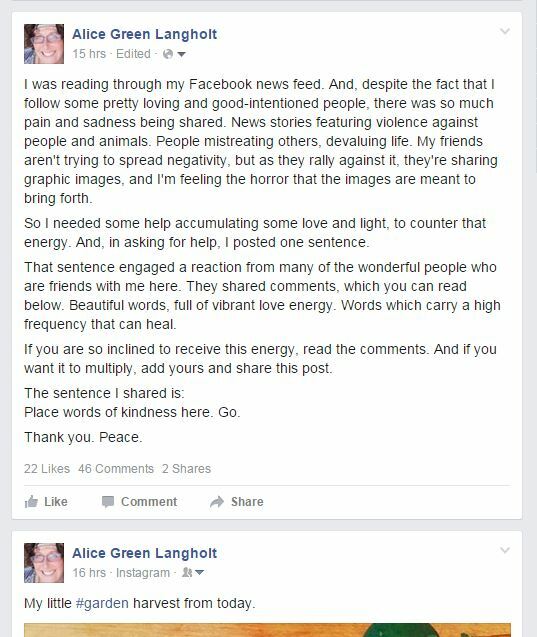 So, I posted this as a gentle call to action to be careful what we post, as pictures and words contain energy. Let’s choose the most positive ways to share our thoughts intended to encourage actions that will make the world better. Kindness doesn’t have to be motivated by horror.